We know, the Apple purists out there will probably insist that your Mac dies a little bit each time you plug a non-Apple branded peripheral into one of its ports, but hey, if OS X can handle a Microsoft keyboard, we're sure this fella from Fujitsu is more than fine. Making a triumphant return -- albeit on the Mac side of things this time -- is the Happy Hacking Keyboard, but instead of rolling sans markings, this one is specifically tailored to play nice with all those Appleicious shortcuts you've burned into your muscle memory. 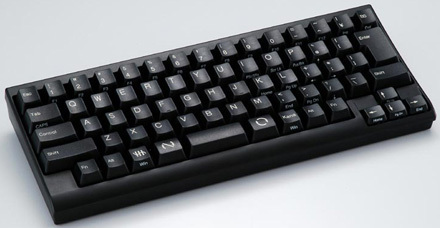 The Happy Hacking Keyboard Lite 2 for Mac looks to come in both American and Japanese arrangements, in black (pictured after the jump) or white, and even touts Universal support for whatever its worth. Furthermore, the USB 1.1 board boasts two extra onboard ports with enough juice to handle "low-power devices," and should withstand "up to 10 million keystrokes" as well. Oh, and for those who are dedicating their every breath to getting the Caps Lock key axed, bust out the champagne, as your least favorite key has been demoted to a function of the Tab key on this here $64 device -- huzzah!